When early Christian artists began creating visual images of their faith they were faced with questions such as what did Jesus look like? 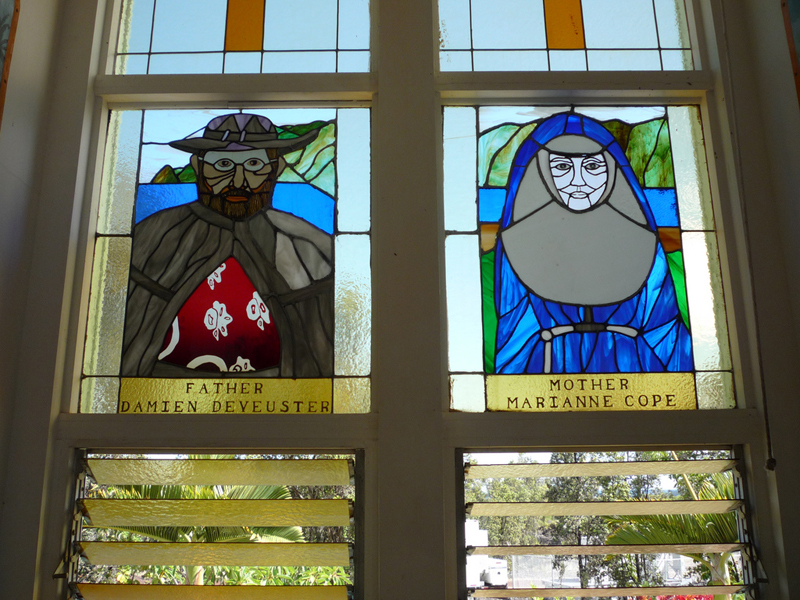 Could or should God be portrayed – if so, how? How would the crucifixion be depicted and what would be the shape of the cross? 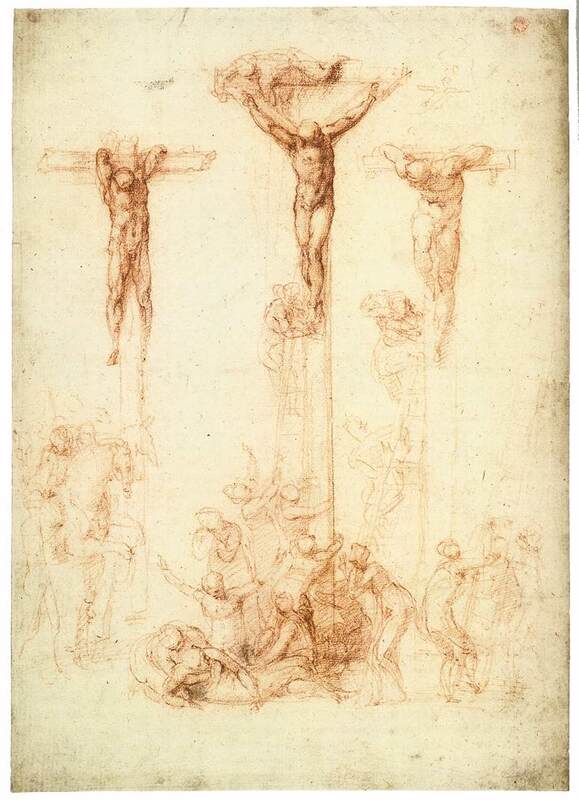 Michelangelo’s chalk drawing, “Crucifixion with Two Thieves,” was sketched possibly as a study for a painting and was not intended to be a complete or permanent work. Because chalk does not have within it a binding agent such as egg yolk or linseed oil, it can be rubbed off a surface easily. Some details in this drawing are not clear and almost lost. Michelangelo depicts the crucifixion as it is taking place. A man on the top of the central cross is making an adjustment to Jesus’ arm while a figure is on a ladder at his feet. Another person is on a ladder at the feet of the thief on the right and an additional ladder is being brought to the site; it is presumed this is to reach the feet of the thief on the left whose unsupported legs are dangling loosely. [It also may be interpreted that this ladder is being removed from the scene] Under the cross on the left are two horses (their images are very light and barely distinguishable). Below the central cross, Mary has fainted and is being assisted. Others are consumed with grief. The familiar Latin cross has a horizontal section approximately one third down from the top but many other forms have been made. 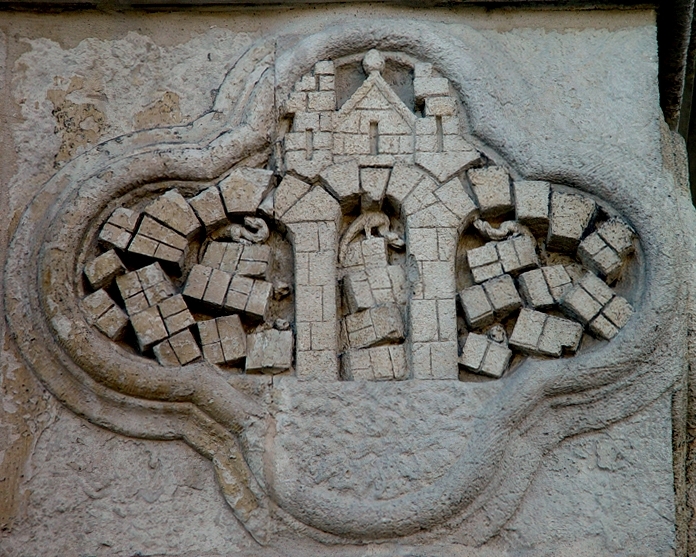 In this drawing the thieves are attached to crossbeams at the very top of the vertical posts, whereas the cross on which Christ is placed is “Y” shaped. This was not a Michelangelo innovation; the “Y” shaped cross was among the earliest depicted in scenes of the crucifixion. Art created in Italy during the turn of the century from the 1490s to the 1520s elicits a sense of awe in us even today. 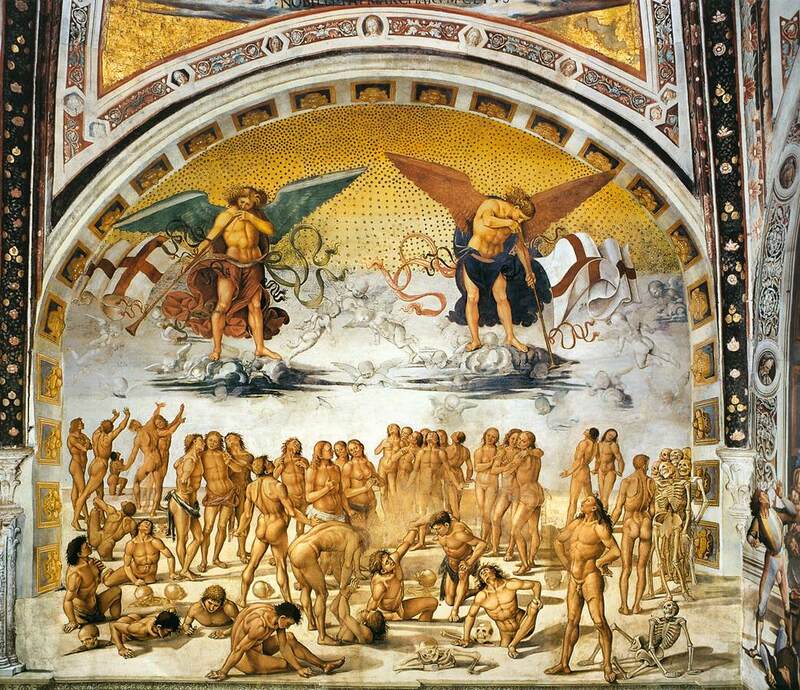 During those years, Michelangelo painted the ceiling of the Sistine Chapel, Leonardo painted the “Last Supper,” Raphael painted “The School of Athens,” and Luca Signorelli painted his fresco cycle in Orvieto Cathedral. Artists of the High Renaissance achieved their remarkable results because problems that dogged earlier artists for many centuries had been resolved. The problem of creating pictorial space was resolved in the early fifteenth century but creating a convincing likeness of a human figure from any point of view was another major challenge. Figures in early paintings were depicted usually in a front or side view with little or no sense of movement; they often were ill-proportioned, stiff in appearance, and in sculpture-like poses. Signorelli’s mastery of anatomy, perspective, and foreshortening gave him the skills and freedom to paint the human form in every conceivable position. He seemed to delight in doing so. In this painting, two larger than life angels are in the sky. They have sounded their trumpets (with Crusader flags attached) and the dead are emerging from the earth; many have risen in full flesh. Others are only partially above the surface and are in the process of lifting themselves out. Some are still in skeleton form; here and there only a skull has popped up. In the central foreground, two men are assisting full-fleshed figures that are emerging and on the far right a man is having a conversation with a group of standing skeletons. Signorelli’s skills matched his fertile imagination and his ability to depict freely the human figure impressed and influenced many of his contemporaries; Michelangelo was among his admirers. Dreams are not part of our physical world and often their images have no reference to anything we remember having seen or experienced. When a dream is vivid we tend to remember it and wonder if it had meaning. Yet, we tend to be skeptical of those who interpret dreams in other than general terms. It seems reasonable, however, that there are times when the content of a dream (e.g. recurring dreams) may be related to events in a life; especially if an event weighs heavily on a person’s mind. Those who look for meaning believe a great deluge and flood, as in the dream experienced by Albrecht Durer, is related to unexpressed fears and emotional turmoil. Whether or not Durer’s dream was rooted in fear is not known but there was a great deal of turmoil in Germany during the later part of his life. It is natural and right to weep for so excellent a man – still you should rather think him blessed, as one whom Christ has taken in the fullness of his wisdom and by a happy death from these most troublesome times, and perhaps from times even more troublesome which are to come, lest one who was worthy to look on nothing but excellence, should be forced to behold things most vile. 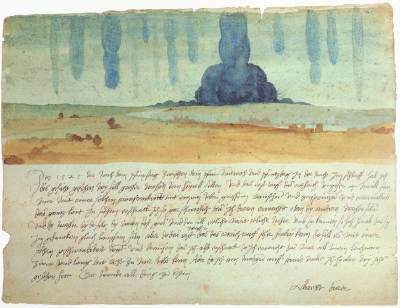 Dreams come in a variety of forms and, unlike the one experienced by Durer, many are pleasant. Often the term “dream” itself is used with positive associations and as a metaphor for a conscious desire; we may wish for a “dream” job, vacation, or home. On a conscious level, dreams also are visualizations of possibilities. Airplanes became a reality because humans observed birds and dreamed of flying. Because we dreamed, men walked on the moon. The Book of Joel cites blessings that were to be bestowed on Israel. In addition to material blessings, God promised a special gift – the gift of the spirit, of dreams and visions; “And afterward, I will pour out my Spirit on all people. Your sons and daughters will prophesy, your old men will dream dreams, your young men will see visions” (Joel 2:28). Revelation, enlightenment, and wondrous achievements have been the result of this gift. The Parables of Our Lord (1863) Click image for more information. In France – from the latter part of the eighteenth to beyond mid-nineteenth century – Neoclassicism was the style of art perpetuated by the state sponsored French Academy and its influence was widespread. Romanticism rose in opposition to it and had far reaching influence as well. England, however, tended to be independent and had its prestigious Royal Academy of Art; it was not easily swayed by outside styles. Instead of falling in line with accepted mid-nineteenth century academic styles, seven young English painters of similar interests – led by John Everett Millais, William Holman Hunt, and Dante Gabriel Rossetti – organized a secret society and called themselves the Pre-Raphaelite Brotherhood. It was their belief that false ideals had artificiality entered art during the Renaissance. As the term, “Pre-Raphaelite” implies, they proposed starting anew by going back to a time before Raphael – to the Middle Ages. One of Millais’s paintings from this period, “Christ at the Home of His Parents,” caused a scandal because the Holy Family was not represented regally as it would have been in a classical Renaissance painting. Instead, Millais depicted a working class family with Christ (as a boy) in his father’s messy carpentry workshop. After his youthful efforts, Millais withdrew from the brotherhood and became an academic painter; his critics accused him of “selling out” for financial gain. In time, he was made a member of the Royal Academy of Art and later became its president. Among Millais’ noted works was a series of drawings illustrating Christ’s parables. These drawings were reproduced as wood engravings by the acclaimed Dalziel brothers and published in 1864 as “Parables of our Lord.” Although some parables are difficult to translate into pictorial form, Millais’ “Parable of the Unjust Judge” is what we might imagine the scene to have been like. In this story, a poor widow desires justice but the judge hearing her case is not sympathetic or compassionate. 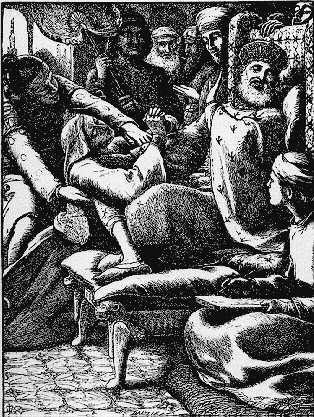 Millais has placed the widow on the floor in front of the judge (seated with ankles crossed) on his cushioned, throne-like chair; an attendant stands by with a fan to contribute to his comfort. The widow is persistent as she leans forward over the judge’s legs and pleads with him while a guard with an arm on either side of the woman is trying to restrain her. The judge seems to regard her as a pest – he turns his face with a look of superior disdain and keeps her at bay with his right arm. His open left hand is in front of his face in a gesture that seems to be saying, “Enough already!” The man peering over the chair and the man standing at the judge’s immediate right are finding the widow’s appeal to be amusing. The scribe, however, seems sympathetic as he lifts his pen momentarily and looks up at the widow. The widow’s persistence paid off and her petition was granted.